When most people hear the word bunion, they generally only think about an issue involving the big toe. However, bunions are not exclusive to the big toe, or hallux; they can also occur at the fifth toe. Bunions at the hallux and the fifth toe develop for different reasons, but both are cosmetic issues, and may eventually become painful if untreated. Bunions, contrary to popular belief, are more than just a bump. 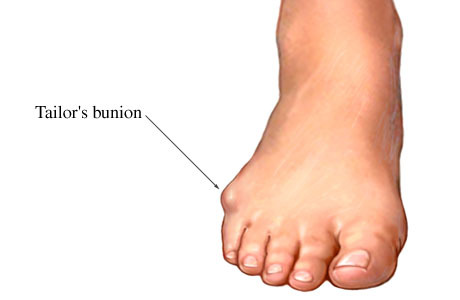 Whether involving the 1st or 5th toe, “bunion” describes a turning in of the toe towards the midline of the foot, and a reactionary bone formation due to the pull of soft tissue. These changes occur because of biomechanical imbalances in the foot. A bunion at the fifth toe, also known as a tailor’s bunion or bunionette, can become irritating when the abnormal enlargement over the fifth metatarsal head rubs on shoes that are too narrow. The constant rubbing and pressure produces a callus and a thickening of the tissues over the bump. Symptoms associated with tailor’s bunions include redness, swelling and pain at the site of enlargement. There are many nonsurgical options that can be considered for treating a tailor’s bunion. For instance, try switching to a shoe with a wider toe box. This will decrease the rubbing pressure that is felt at the base of your little toe. You can also try padding the tailor’s bunion to reduce pain while wearing shoes. Anti-inflammatory pain medications, like Ibuprofen, can be used to decrease the pain and inflammation around the area, and a corticosteroid injection directly into the inflamed tissue can help reduce the symptoms as well. Surgical treatments should be considered if you still have pain despite trying nonsurgical options. Before surgery, your podiatrist will take x-rays and will perform a thorough clinical exam. This will help the podiatrist choose the best surgery procedure for you. The recovery time varies, but the majority of patients undergoing surgery have a great outcome. Tailor’s bunions can be a painful problem. The constant rubbing on shoes, redness and swelling in the area can cause added stress to your life. If you have a painful tailor’s bunion, schedule an appointment with your podiatrist to discuss the treatment options that are best for you!